The human body is a remarkably adaptive organism. It constantly adapts to new challenges presented to it by growing, changing, and evolving. Bodybuilders are no exception. Every time we enter the gym and present our muscles with a brutal workout, our muscles respond by growing to meet this demand. Once the muscle has adequately adapted to a workload, it stops growing. When you see the same gym members benching with the same 135 pounds, looking the same for 1, or 2 or 3 straight years, you see a perfect example of this. Their bodies have adapted to the 135-pound workload and are no longer required to grow to meet a changing workload. Since the goal of the bodybuilder is growth, the means by which this muscle growth is achieved should be continual workload adjustment so that no total adaptation is every achieved. The bodybuilder much present the working muscles with a different workload each time. There are several ways to do this, including various rep and set ranges, as well as through exercise selection. However, one commonly overlooked method, which is highly effective, is known as drop sets. Drop sets start like any other set for the first several reps. You complete your 6 to 10 repetitions with a weight until you reach muscle failure. Then, instead of stopping as you normally would, you should reduce the weight by about 20% and do several additional repetitions. 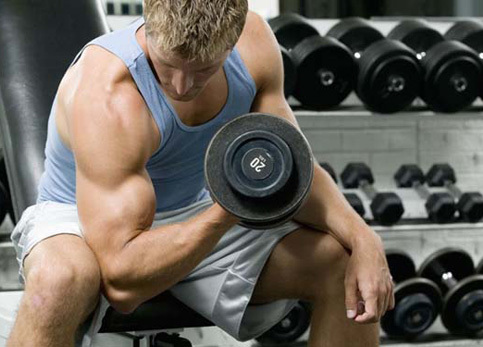 Once you complete them, reduce the weight by another 20-30% and complete several final repetitions. Drops sets are very effective for two reasons. First, they require the muscle group to exert force using both the fast twitch fibers (from the heavy initial repetitions) and the slow-twitch muscle fibers (from the final high repetitions). Additionally, the overall volume of blood that is moved into the muscle group – the “pump” – fills that region of the body with oxygen- and protein-rich blood, which makes the muscle grow. A few warnings should be issued before the practice of regularly using drop sets is begun. Drop sets can burn out a bodybuilder very quick, so use them sporadically so as to give the central nervous system (CNS) adequate time for recovery. Use a partner whenever possible to ensure you can safely remove the weight. Running and other rushing while mid-way through an exhausting set can lead to injuries. Above all, remember that the goal is not to achieve any particular number of weight or repetitions – the goal is maximum muscle stimulation. Have fun! This entry was posted in Training and tagged Bodybuilding, Drops Sets, Drops Sets Bodybuilding, Intensity Training, Maximal Intensity Training, Training Intensity, Training Tips. Bookmark the permalink.